Two patterns are included in this DVD set on a separate CD. Take the CD to your copy center and have them print your patterns for you. Each pattern is normally $ 13.95, so this DVD is an incredible savings. The 2 individual patterns let you practice all the major elements of landscapes while exploring new techniques to build your confidence. 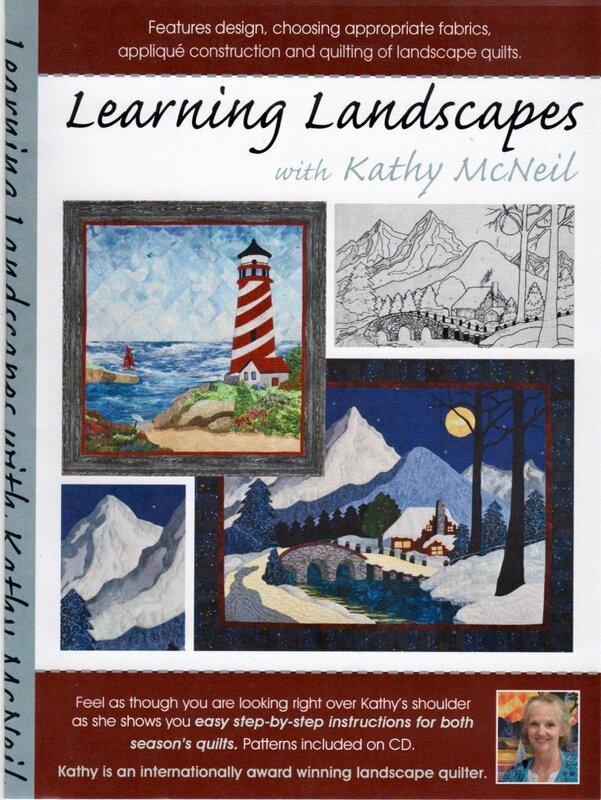 An hour and 26 minutes, packed with information about creating landscapes. Watch over Kathy's shoulder as she creates the scenes in the patterns included in the set. Appliqué Techniques: turned and finished edges by hand or machine, raw edge or fused appliqué. Quilting the pictorial quilt. The 2 individual patterns let you practice all the major elements of landscapes while exploring new techniques to build your confidence.